July 2, 2015 We had a succesful webinar for the MEA region. A new EMEA webinar will take place in September. July 1, 2015 We will have a visit to the France office (La Défense) on July 7-8 2015. If partners in the region want to meet with us, please contact us. June 26, 2015 We had a great day at the Road to Rio Hockey event in Brasschaat, Belgium. 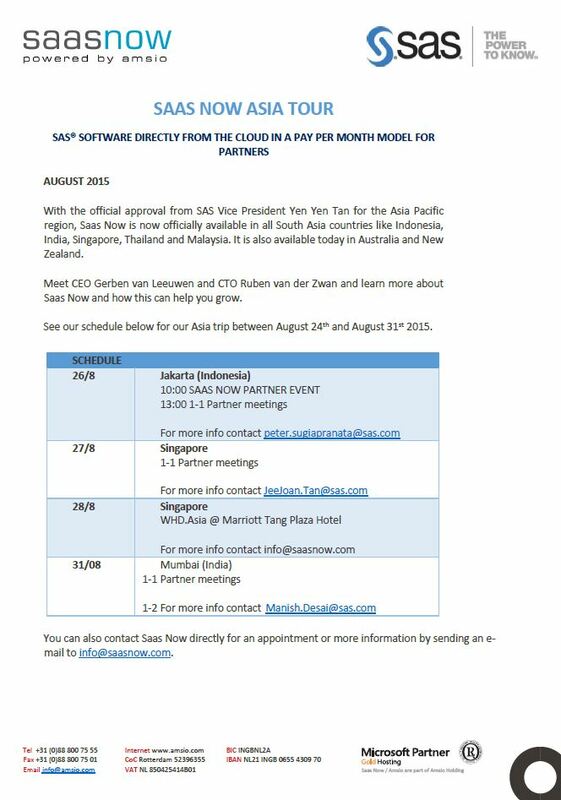 Invited by our SaasNow partner MC-2-BIS. June 23, 2015 Today we start with a couple of partner meetings in Portugal. June 20, 2015 We are today visiting the SAS office in Hungary. If local partners like to meet, please contact us. June 9, 2015 SaasNow is attending the German Local Forum in Bochem. Please visit our booth for more information about SaasNow! May 20, 2015 Tomorrow we will have some partner meetings in the SAS Madrid office. May 12, 2015 Visit our booth today at the SAS Forum Switzerland in the Marriott Hotel in Zurich. April 25, 2015 This week we will attend at SAS global forum in Dallas, TX. We give demo’s at our booth and you find free little bags of M&M’s. Please visit our booth at meet with our staff and board. We found out that Centreal East Europe, the Nordics, Canada and England also want to sell SaasNow in their country. March 30, 2015 Official launch of SaasNow. The new contract is signed and includes an approval for the whole MEA region and the DACH region.